Univers™ font created by Adrian Frutiger, Alexei Chekulayev, this eye catching font was designed keeping Swiss principles as the base for design. A strict code of standard was imposed across the elements of the font series. Right from very light to dark, and extra condensed a concordance of design was formed in the foundry type. The photocomposition fonts also followed the rule. The beauty of this font lies in its flexile nature. Any version can be mixed within a word. 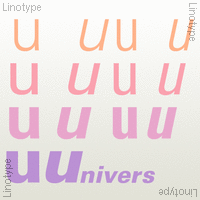 Univers is also known for its incredible ability to display a uniform series via chastising the central designs.